On Monday, charges were filed against Trump’s campaign manager Paul Manafort and the mood changed from Friday’s all-time highs. The US PCE report at 1230 was as expected. SPX and NKY fell slightly, but DAX and FTSE were flat. DAX was particularly subdued, trading in a narrow 40-point range. USD was down across the board as were bond yields, and Gold was up. Oil was nearly flat, added a few cents on the day to make a new 7-month high. It was definitely Turnaround Tuesday on the last day of the month. SPX almost exactly reversed Monday’s move as did Gold, JPY, bond yields and AUD. NKY and FTSE were also up, and although Germany was closed, DAX futures rose by 70 points. CAD was down after the Canadian GDP miss at 1230. At 1000, Eurozone GDP beat (2.5% vs 2.4%) but CPI miss (1.4% vs 1.5%). This means of course that real GDP beat (1.1%) by 0.2%, but surprisingly EUR was flat. GBP was up on the day on expectations of the Thursday rate hike. 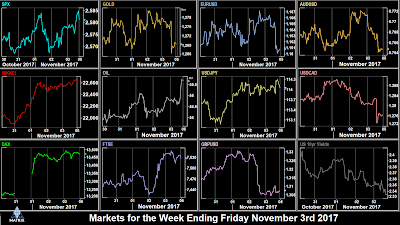 Wednesday was another down day for most indices, except DAX where the previous day’s closure probably produced a delayed rally. After a brief spike to a new all-time high following the ADP jobs beat at 1215 (235k vs 225k), SPX ended down, as did NKY and FTSE. There was surprisingly little immediate reaction to the Fed Rate hold at 1900, but USD did well all day, rising against all currencies. Gold’s behaviour often changes, today it was up in line with stocks falling, but ignoring the stronger dollar. Bond yields were also detached from the rising dollar. They fell sharply (4bp) before the US session opened, and despite a brief rally on the Fed release, ended the day down. Thursday saw the US tax bill unveiled (a day late), and President Trump confirmed the widely expected appointment of Jerome ‘Jay’ Powell as the new Fed Chair, replacing Janet Yellen. Both news items were largely priced into markets. SPX rose gently on the day. NKY advanced very slightly and DAX was flat. FTSE rose over 100 points, but this was largely a function of the move in GBP. NDX gapped after Facebook beat estimates the night before, but gave up those gains during the US session to end the day down. The biggest market mover on the day was the Bank of England rate rise. Despite the headlines being hawkish (first rise in 10 years, a ‘beat’ on the committee votes (7-2 vs 6-3 estimate), the accompanying statement that further increases would be limited and gradual was read as dovish. GBP fell 1.34% in the next five hours to touch a four-week low, and become the only currency to have an outside week. A clear example of buy the mystery sell the history. Otherwise USD was slightly down on the day against other currencies, Gold was slightly up, and yields were down. But like equities, there was not much response considering the significance of events. Friday was NFP day and a surprise miss after the ADP beat, although the estimate was large, and the figure of 261k was still good, and above the ADP result. SPX fell 0.22% on the print, but had started to recover even before the opening bell and ended the day well up, finishing the day and week at another all-time high. DJIA and NDX also made new all-time highs. NKY similarly made a new 21-year high, but FTSE and DAX were fairly flat. The Canadian jobs figure was a substantial beat (35.5k vs 14.5k estimate), equivalent to 319k in US terms, as the US has nine times the population of Canada. USDCAD dropped 120 pips (0.92%) in 30 minutes, and then started to recover. Otherwise USD had a good day but the picture was uneven. EUR, AUD and Gold were sharply down, NZD only slightly down, and GBP was even slightly up. DXY finished 0.18% up on the day. After a fairly quiet week, Oil was strongly bid from about 1530, and put on 2.43% in the three hours until the pit closed the for week. These are the prices movements for the week on the instruments we cover. Currency movement was very muted with all USD pairs except GBP having an inside week. The best trade would have been to sell GBPNZD, down 0.83%. 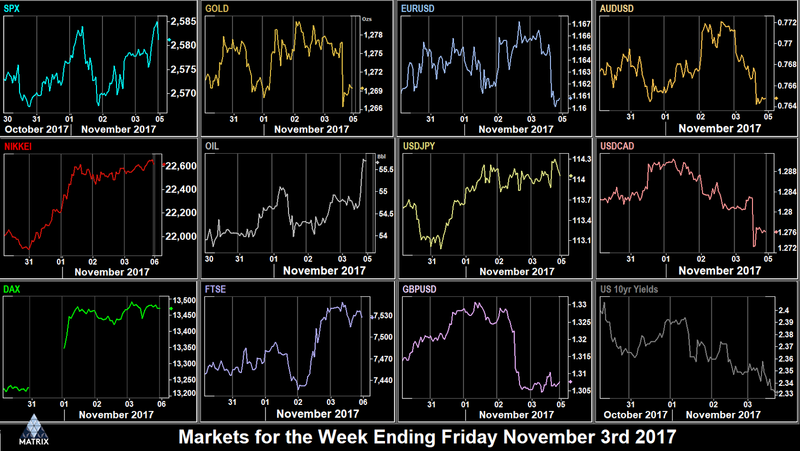 The strongest index movement was (for the third week) NKY up 1.68%, but as usual, the most volatile instrument was Oil, up 2.64%. Over the weekend President Trump is playing golf with Japanese PM Abe, and Daylight Savings time ends in the US, bringing New York back in line with Europe. Spain has issued an arrest warrant for Catalan leader Puigdemont, who is holed up in Brussels. This can’t be helpful to EUR, although the effect of the crisis has been largely confined to IBEX volatility. There are regional elections in Sicily which may give clues to the forthcoming Italian general election which must be held within six months from now. Overall next week looks like being quieter than last, but as we saw little volatility on a lot of news then, we cannot be certainly of low volatility now. With little news on Monday, focus turns to the first draft of the tax bill which was being prepared over the weekend. At the very end of the day are the usually uneventful BoJ MPC minutes. Tuesday see the RBA rate decision. A hold is expected. Of more interest is a possible downgrade of the bank’s inflation forecast which would further depress AUD — unless of course it is already baked into the price which has already fallen 3% in the last four weeks. Also President Trump arrives in South Korea and speaks at the National Assembly, an obvious time for some reaction from Kim Jong Un. BoC Governor Poloz gives a speech in Montreal at 1745. The State Opening of Parliament in New Zealand ‘Throne Speech’ (equivalent to the British Queen’s Speech) will outline the priorities for the new incoming government and may move NZD. On Wednesday Trump is in Beijing with President Xi, so again look out for unexpected comments about North Korea, or indeed the relationship with China. There are also the relatively unimportant Polish rate decision and Russian inflation figures. The main event of the day comes at end for Europeans and Americans, the NZD rate decision. A hold is expected. NZD has fallen nearly 10% in three months, and recently bounced off May support. In a similar but opposite case to Australia, traders will be looking for an upgrade to the inflation forecast, which would be positive for NZD. Thursday has a lot of data, but none of it particularly important, unless of course there are big upsets, for example in the Chinese inflation print at 0130. The Bank of France Governor Villeroy de Galhau, an ECB board member speaks in Brussels at 1500. Friday is similarly light, although there is a raft of UK manufacturing stats in the European morning. As Veterans Day falls on a Saturday this year, Friday is a public holiday in the US. Stock and bond markets are open as normal, but like Columbus Day, trading is expected to be lighter than normal.